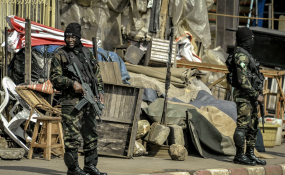 According to multiple sources Chadian soldiers, dispatched by Chadian President Idriss Deby at the request of Cameroonian President Paul Biya, have been fighting for several weeks alongside Cameroonian's armed forces against the English-speaking separatists. The information we are getting is that the Cameroonian military is finding it difficult to fight the separatists. The military were not prepared for this kind of combat," he said, adding that even the Chadian military is "feeling discouraged". Despite several attempts, the communication officer of the Cameroonian ministry of defense did not respond to our inquiries. Meanwhile, on the field, the situation is far from calming down despite the fact that the independence leaders were abducted from Nigeria and sent to Cameroon under conditions the UN says violates the rules of of International law.